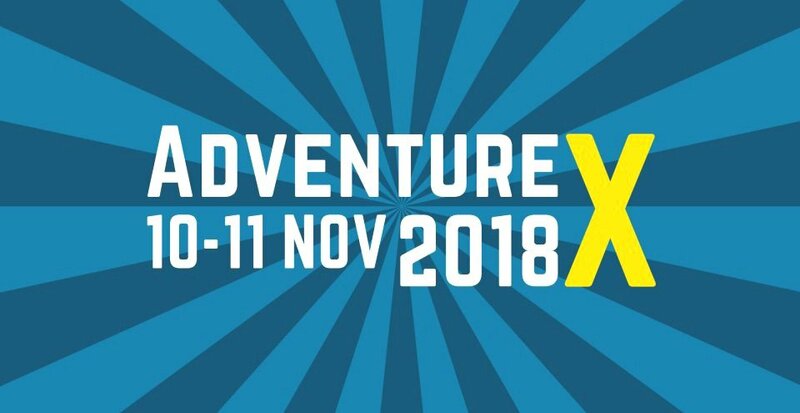 AdventureX just keeps on growing. This year it saw a big jump in capacity, with its previous venue limit of 230 people almost doubling to 400 at the new British Library location in London. This is also the first year the event required paid admission, with all tickets snapped up less than a week after becoming available. Some may have feared that this leap in size would change the atmosphere of the convention. Fortunately, those concerns were easily put to rest by a weekend that was as fun and friendly as always. There were once again a variety of talks on all aspects of narrative gaming, from writing realistic dialogue to making games more inclusive of the disabled. And, of course, a huge mixture of titles were exhibited, and our intrepid team of reporters set out to look them over. 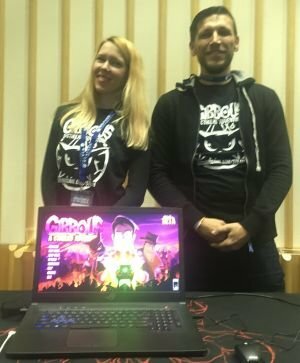 At last year's AdventureX, the Stuck in the Attic team applied too late to be official exhibitors. This year, with Gibbous: A Cthulhu Adventure now nearing completion, they made sure to get in early. Whilst inspired by the works of H.P. Lovecraft, as you’d expect of its title, it would be fair to say this is far from a horrific game. References to its inspiration are plentiful, but played with a sense of humour that removes the horror aspect whilst still obviously respecting the source. The central character is hapless librarian Buzz Kerwan, whose careless reading of the Necronomicon causes his cat to start speaking. With this sarcastic and somewhat uncooperative companion, along with occasional assistance from detective Don R Ketype, Buzz must try to prevent a cult from seizing the book for their own dark purposes. A year ago, about half the game had been made so the demo only showed the opening scenes. This year Gibbous is almost done, with only a handful of lines of dialogue still to be recorded and a few late bugs to sort out. As a result, Cami Cuibus and Liviu Boar were able to take players to various chapters throughout, allowing us to see entirely different parts of the story. I played a section in the strange village of Fishmouth, where the residents made clear they were not stopping me from entering, just “strongly discouraging” it. Using simple point-and-click controls, I directed Buzz and his reluctant “friend” around the village in third-person view. Stealing the identity of a person with legitimate reason to enter the village took some lateral thinking. I enjoyed the orchestral soundtrack backing the action, and the stylish hand-painted cartoon art. Of particular joy to me were the idle animations of Kitteh, my feline companion. Normally she will just sit with her tail waving back and forth. Leave her long enough, though, and she will start engaging in other typical cat behaviour, such as stretching to wash her back legs. The voice acting is also a treat for the ears, especially Kitteh's complaints about the things you make her do to advance. There is already a Steam page available, with the game to be released on Windows, Mac and Linux. Barring late complications, Gibbous: A Cthulhu Adventure is on track to launch in January 2019. In the meantime, more detail can be found on the official website. With their first comic mystery anthology starring an investigator of the supernatural proving a success, developer Spooky Doorway are ready to build on that with a sequel. And thanks to their recent Kickstarter surpassing its goal, they have the funds to do more this time. Whilst there will be an overall story arc in the new collection, the team intend to keep the individual chapters as standalone stories like before. They feel that their target audience is the more casual gamer who has limited play time. For such people, keeping track of complex plots and objectives is more problematic, hence a game with bite-size challenges offers more appeal to that market. As not everyone at AdventureX had played the first season, a computer offering a sample of the original game was on display. Those simply seeking a taste of the second season could play the start of a new story. The same pixel art style of its predecessor is used once again here, as is the simple point-and-click interface. Many of the characters also return, including on-screen protagonists Detective Francis McQueen and Officer Dooley. The setting for the demo was a spooky carnival, whose show has adopted a new approach due to society being more aware of cruelty to animals: a vegan circus consisting solely of mechanical creatures. As McQueen, clearing away a malfunctioning elephant formed the main puzzle, though there were several steps involved in solving it. This was accompanied by a spooky background sound, though the dialogue featured the same off-beat humour of the last game. This was most noticeable in conversations with Dooley, whose tendency to lose focus on the job can produce some surreal but amusing contrasts to the otherworldly dangers you face. 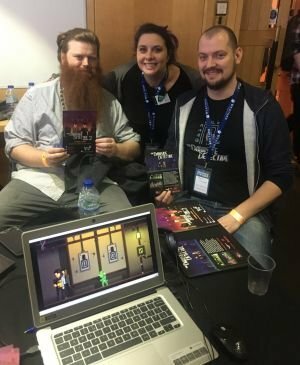 Spooky Doorway are aiming for a release on Windows, Mac, Linux and Switch in the first quarter of 2020. While you wait, more details about both games can be found on the series website. With Four Last Things, developer Joe Richardson used classical art and music to tell a whimsical tale of sin and repentance. 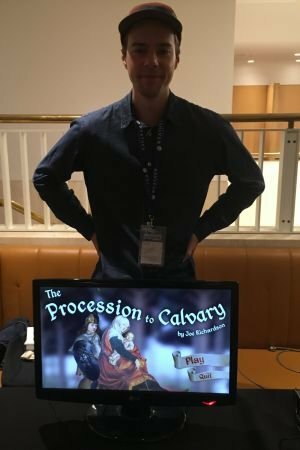 In his new game, The Procession to Calvary, he has continued that approach, seeking out even more disturbing scenes with which to surprise, bemuse and amuse players. At this point in development, Richardson is still not certain whether this will be a direct sequel to the original game, or an entirely separate story. As it stands, the current version has you playing an entirely new character this time round named Erica, a soldier coming back from the holy war (which we won, apparently). As before, characters are paper dolls whose arms and legs move on pivots rather than animating naturally, set against a collage of public domain background art from the Renaissance era. The demo started with Erica having hitched a lift with a woman and child (who may or may not be the Madonna and Jesus). The cart breaks outside Erica's desired destination, but her plans to simply abandon her helper are soon dashed. The city gatekeepers (one of whom repeatedly points out his “MASSIVE KEY”) refuse to let Erica in. Having to go back to her erstwhile travelling companion for assistance, the protagonist is tasked with repairing the cart and feeding the donkey. This objective leads to traversing a variety of surreal scenes. The same single-click interface as the previous game is used here, guiding the large, heavily-armoured protagonist around the screen. The dark humour of the original also shines through once again. There are some very odd inhabitants to meet, including a choir of kittens and a lute goblin (playing appropriate music) encountered along the way. I should imagine any fans of the first game will find this one very much to their tastes as well. This is not a game for kids, however, as despite its comedic touch overall, some of the depictions of medieval torture in one scene are quite gruesome. Release is planned for April 2019, though this is a somewhat tentative date for now. The Procession to Calvary will be available on Windows and Mac, as well as iOS and Android devices. Is it me or the protagonist of the The Procession to Calvary is the same as the one from Four Last Things (which i played and enjoyed)? The article mentions that you get to play a new character in the new game. Definitely not just you. That is indeed the same protagonist, which was Joe’s plan originally. But he’s since come up with a new character that he likes, and that was the one he was showing at AX. He says he’s still not 100% sure who the main character will be, or how closely related to the first game it will be as a result. The game is very much a work in progress, right before our eyes.